The TENNANT 1120 is an electric extractor. 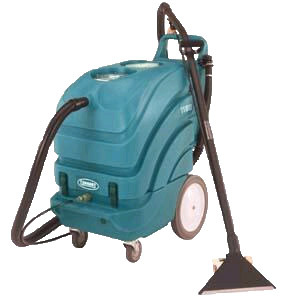 It is is a large 15 gallon capacity carpet extractor utilizing Tennant's patented expansion-cavity bladder system which allows for a more compact machine. The TENNANT 1120 is equipped with two large rear wheels to aid in transportation and manuvering. The unit has a rotationally molded polyethylene tank and chassis.